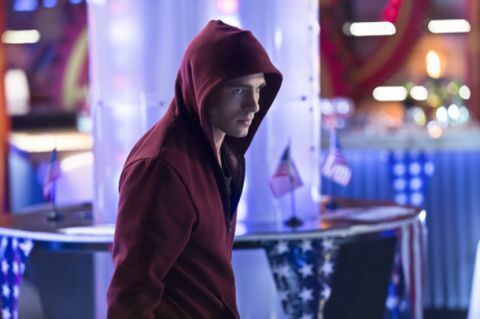 THE VERDICT: The DC incarnation of Roy Harper was elevated to comic book greatness by a bold, uncompromising storyline in the early ‘70s that saw him slide from feisty kid sidekick to hopeless smack addict. Roy’s current arc in Arrow feels like it’s trying to steal some of the power of that groundbreaking tale – his shaking hands play like a direct reference to his junkie days – but the substitution of make- believe mirakuru for street level heroin only defangs the story. And so, ironically, the comic book version feels distinctly less comic book than this live action take. The bulk of this episode feels solid rather than inspired. Roy seems so lobotomised on his rampage that it’s hard to remember that we should be caring for this character. It’s left to other members of the cast to supply the emotional beats: Sara’s chilling determination to kill, Moira’s equally cold treatment of the mother of Oliver’s unborn child. There are some fine flourishes – Roy’s hallucination of Thea is nicely done while Oliver’s screams of pain in the clock tower are truly jolting, bringing a whole new vulnerability to the show’s hero – but you’d be forgiven for thinking that this is Arrow cooking on low heat. TRIVIA: Richard Keats makes his fifth appearance as trusty surgeon Dr Lockhart. Anyone else sense he’ll soon be made an official member of Team Arrow? WINCE OF THE WEEK: “It made him strong,” says Sin. “Like comic book strong. I know it sounds nuts.” File next to “It was like something out of a science fiction film!” or “I feel like I’m in a horror movie!” as the kind of clankingly knowing dialogue that never plays smartly onscreen.